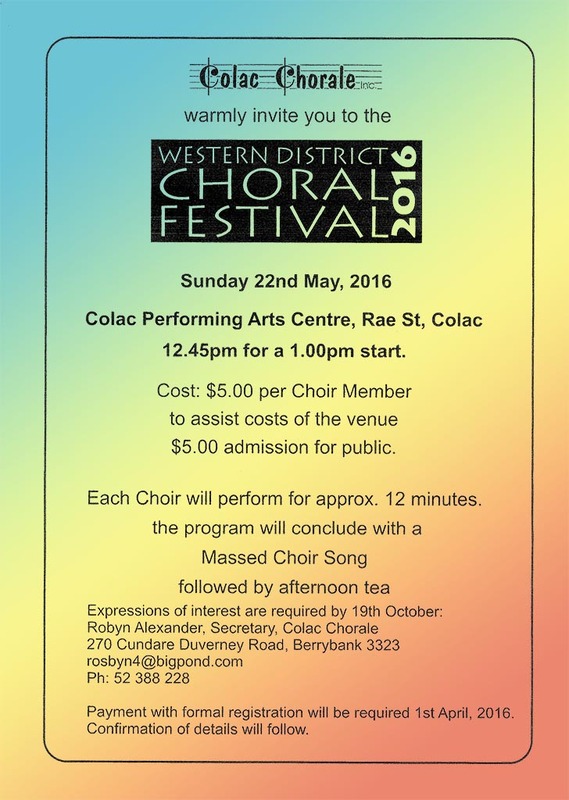 The Colac Chorale will host next year’s Western District Choral Festival. Early entries are invited from all choirs from Western and Central Victoria to South East South Australia. The festival will be held on Sunday, May 22nd, 2016. Details are on the poster above. Choir groups are urged to “put their names down” for what promises to be an exciting and interesting combined Concert, featuring our member groups. These ‘get-togethers’ are also a valuable and enjoyable to our “Grapevine” networks in our S.W. Region. This entry was posted in Performances, Western District Choral Festival and tagged The Colac Chorale, Western District Choral Festival by hlyth2013. Bookmark the permalink.